Art Couture Clothing and Creative Experiences for Unstoppable Women! My name is Carol Lorraine. I am an artist and designer of Wearable Art and Creative Soulful Experiences for unstoppable women! Are you ready to take the risk to blossom into the full magnificent woman you are? Let’s “water the creative seeds” that are already within you; nurture those sparks of aliveness and creativity that are inside the bud of who you are, waiting to blossom. Dress to Express YOUR FEMININE POWER! You come to life from the inside out, like the beautiful radiant flower that you are. And, most importantly? FEEL the deeper connection to life and to your essence. You will become the CREATOR you were born to be. When this happens, your life and work become a beautiful masterpiece-a work of art, your soul's vision and purpose. Are you ready to step into your radiant power and shine brightly? 1. Receive a free creative visualization. This is a simple daily practice that will raise your vibration to the highest consciousness of self-love and joy. Lift out of lackluster, negativity, and shine brightly. 2. Talk with me for a FREE (no strings attached) Awakening Your Soul's Beauty Session to explore universal truths and transforming exercises to discover how to dress to express your soul’s vision. EMAIL ME to Schedule! Sign up for your FREE gifts! Awakening your Soul's Beauty~~A Creative Visualization. A simple daily practice that will raise you to your highest vibration. Lift out of lackluster and negativity quickly and easily. The image above, "The Magnificent Six," is inspired from sacred geometry. The 6 overlapping circles create a perfect flower with 6 petals. Your outer beauty blooms from within the heart and soul of your inner JOY! 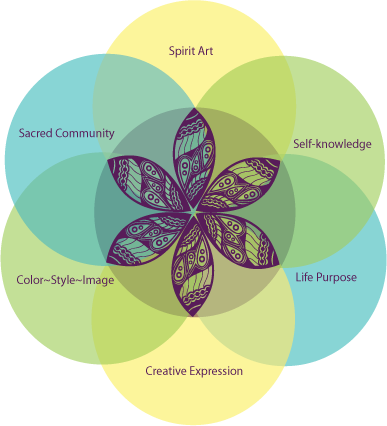 Each circle is necessary for you to REVEAL the JOYFUL MASTERPIECE WITHIN YOU and grow an ARTFUL LIFE you love. Click on any circle and go to the page that describes a way you can discover this. With my loving care and support, you will be guided to JOYFUL LIVING.